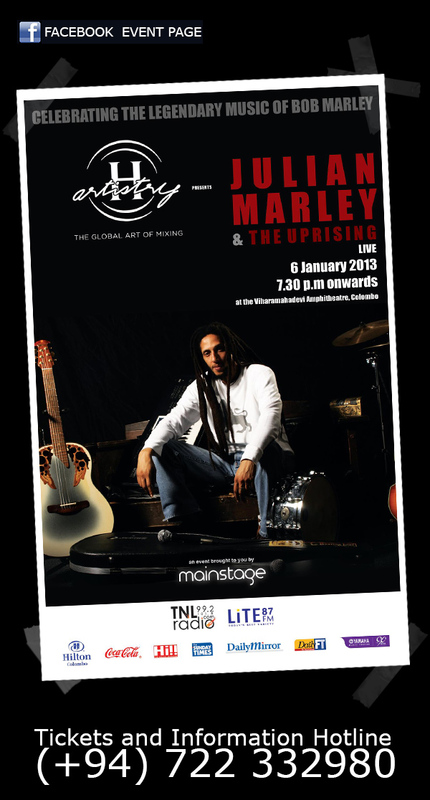 Mainstage Events Presents Julian Marley & The Uprising Live in Sri Lanka for the very first time bringing to life the legacy of Reggae Legend Bob Marley. Opening Performances by Hikkaduwa's Best Percussion Band - Elephant Foot & Sri Lanka's First Reggae Rap Artist Shiraz 'Rude Bwoy'. Be at Viharamahadevi Amphitheatre, Colombo on the 6th Jan 2013, 7.30pm onwards. This is a Concert you definitely MUST NOT MISS! !